0 Comment September 12, 2017 Like? In this episode of “Back to the Basics”, we review basic network setup for PTZOptics cameras. We use a DCHP Router with a built-in network switch and wireless access point which allows us to setup an entire network and WiFi system. We review the basics of networking and how to connect your PTZOptics cameras to a switch, how to use PoE (Power Over Ethernet) and how to set static IP Addresses. This review video will help beginners understand networking for live streaming camera systems and provides a live demonstration of wireless camera control along with a video setup ideal for broadcasting to YouTube or Facebook. This live stream was available on both YouTube Live and Facebook Live for viewers to ask question live. We answer and support comments about live streaming camera networking, troubleshooting and setup. 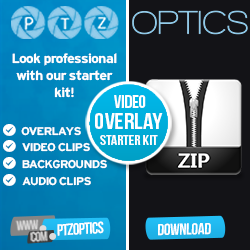 PTZOptics Live Streaming Camera Manufacture focused on HD-SDI, USB 3.0, HDMI and IP streaming cameras. Our YouTube channel features live broadcasting tips, tricks and tutorials for live streaming and more.